A Family CD can have a very positive long-lasting effect on your family's future while, at the same time, protecting your family history. 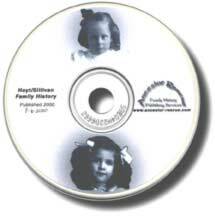 Imagine a CD adorned with your family graphics. You slip it into a PC (or Mac) and suddenly you're transported back in time--experiencing the lives of your ancestors. You have instant access to family genealogical data, pictures and documents--right at your fingertips. While you're printing beautiful portraits of your great grandfather, you scan through your family history, scrapbooks and photo albums. You find yourself on an interactive journey through the lives of your ancestors. You e-mail a cousin--barely able to contain your excitement. You include pictures and stories of her dad that invoke poignant memories. You send her a copy of the family CD, for her very own. Just imagine the incredible possibilities! Each family member can have their own virtual master of family keepsakes. Your ancestor's pictures can be easily shared anytime, anywhere in the world. Your priceless heirlooms are no longer unique--they are thereby protected or "rescued." Family portraits no long suffer from fading and loss of detail. Your descendants are assured of a priceless heritage. Can you risk your pictures any longer? Do you want them to be there, in perfect condition, for future generations to benefit from? Shouldn't you do something to protect them now, before it's too late? Getting Started Gather your priceless memories today. This link provides free step-by-step "ancestor-rescuing" directions and tips that have worked well for others. Archiving Your Photos Learn more about the science of photo preservation. Ancestor-Rescue Can Help This site is dedicated to helping people like yourself with the sometimes overwhelming task of computerizing family treasures. Weather you do it yourself or need some level of help, follow this link to examples of what can be accomplished. I'm limited only by your budget and schedule. You'll find my help indispensable if you want to improve or enhance your Family CD project and haven't the time or experience. As a professional, I can archive/re-master your graphics and, perhaps, produce a professional family web site with an artistic personal touch. I can publish (design, graphics, layout, etc.) many types of family or professional newsletters. Maybe you need a professionally-designed logo for your upcoming family reunion or a website to commemorate it. Whatever graphics, project management, or organizational help you need, I'm here for you.